Erb’s Palsy, which is named for the doctor who first recognized and described the condition, is a form of brachial plexus birth palsy, which is a weakness or loss of movement in a child’s shoulder, arm, hand, or fingers caused by damage to a bundle of nerves near the neck, known as the brachial plexus. Erb’s palsy is brachial plexus birth palsy that affects the upper nerves of the brachial plexus and is considered to be less severe than global or total brachial plexus birth palsy, which affects both the upper and lower nerves. Approximately one or two out of every 1,000 babies is born with Erb’s Palsy. Symptoms may include loss of feeling in the affected arm, complete or partial paralysis of the arm, limpness, or weakness in the arm. Certain injuries, including stretched, ruptured, or torn nerves, or scar tissue around the nerves, may occur as a result. In some cases of Erb’s Palsy, the affected arm may not grow to the size of the unaffected arm. Though many cases of Erb’s Palsy resolve within the first two years of a child’s life, others result in lifelong consequences. Erb’s and other brachial plexus birth palsies may be caused by medical malpractice during the delivery and labor stages of childbirth and even during a woman’s pregnancy. Though Erb’s Palsy is most often caused by shoulder dystocia, it may also result from the stretching or pulling of a baby’s neck during a difficult delivery, when the baby is over the average weight for its gestational age (fetal macrosomia) and has trouble fitting through the birth canal, when the baby presents in a breech position, when the mother’s labor is prolonged and steps are taken to speed the delivery, or when a complication necessitates a quick completion of the delivery process. Birth injury and Erb’s Palsy lawyer Jeffrey Killino has extensive experience with all types of birth injury cases, including those arising from Erb’s Palsy or other brachial plexus palsy birth injuries. If your child has sustained an Erb’s Palsy or other childbirth injury and you suspect the injury was due to medical malpractice or negligence during your pregnancy or the labor and delivery stages of your child’s birth, you may be entitled to compensation from the responsible medical professionals. Contact attorney Killino at 877-412-8490 for a free evaluation of your case and information about your legal rights and options. The negligence of an obstetrician or other medical personnel during a mother’s pregnancy or the labor and delivery stages of childbirth may result in a child’s Erb’s Palsy or other brachial plexus palsy birth injury. The failure to monitor the mother’s weight and diabetes during pregnancy may result in shoulder dystocia, for example, which may lead to an Erb’s Palsy injury. Shoulder dystocia, the catching of the infant’s shoulder on the mother’s pelvic bone as the infant passes through the birth canal during a vaginal delivery, is the major cause of Erb’s Palsy injuries, according to the American Academy of Pediatrics (AAP), and may result from medical negligence or malpractice during the mother’s pregnancy and/or during the labor and delivery stages of a child’s birth. If, for example, an obstetrician or physician negligently fails to recognize the presence of a condition or complication during a woman’s pregnancy that increases the risk of shoulder dystocia or to take appropriate precautions to reduce such a risk, the obstetrician’s negligence may result in the physician’s liability for an infant’s Erb’s Palsy childbirth injury if the physician’s negligence is determined to have been a cause of the child’s Erb’s Palsy injury. This may occur, for instance, when a mother becomes diabetic or gains an excessive amount of weight during pregnancy, and the weight gain or diabetes was not properly monitored and/or managed by her obstetrician to minimize the risk of injury to the fetus. The mother’s excessive weight may increase the weight and size of the fetus, which thereby increases the risk of shoulder dystocia and a resulting Erb’s Palsy injury. In addition to shoulder dystocia, an Erb’s Palsy injury might also be caused by excessive pulling on an infant’s shoulders, head, or neck during a delivery, by pressure on the infant’s arms during a breech presentation birth, or when an obstetrician or other medical professional assisting in a child’s birth pulls an infant’s head toward the side as the infant’s shoulders pass through the birth canal. 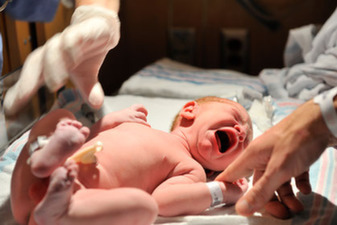 The employment of any of these methods of childbirth assistance may be found to constitute actionable negligence on the part of medical professionals assisting in a child’s birth and result in liability for a child’s Erb’s Palsy injury if such negligence is determined to have been a cause of the child’s injury. If your child was diagnosed with a childbirth injury such as an Erb’s Palsy or other brachial plexus palsy injury and you suspect that medical malpractice or negligence may have been a cause of your child’s injury, birth injury and Erb’s Palsy lawyer Jeffrey Killino will help you seek the justice you and your child deserve. 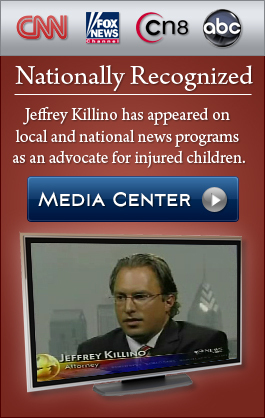 Contact attorney Jeffrey Killino at 877-412-8490 for aggressive and compassionate representation of your child’s rights.